Hi there! So, I have something special to share with you today! 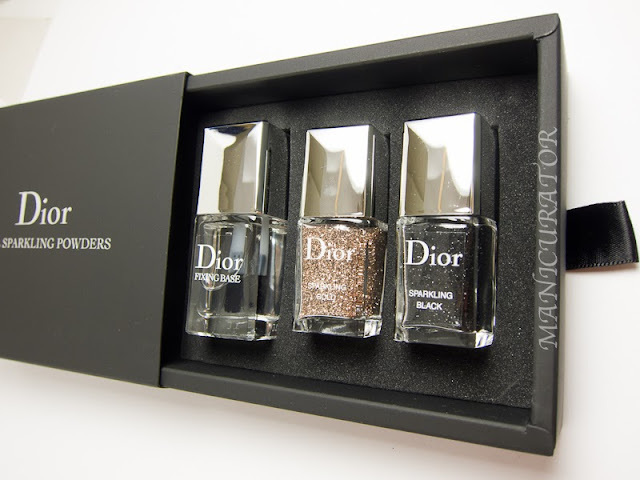 Dior Beauty has recently released a set of nail glitters, Dior Sparkling Powders. These are available now as a Nordstrom exclusive and on Dior.com at $48 for the set. These are limited edition so scoop them up if you are thinking about it! 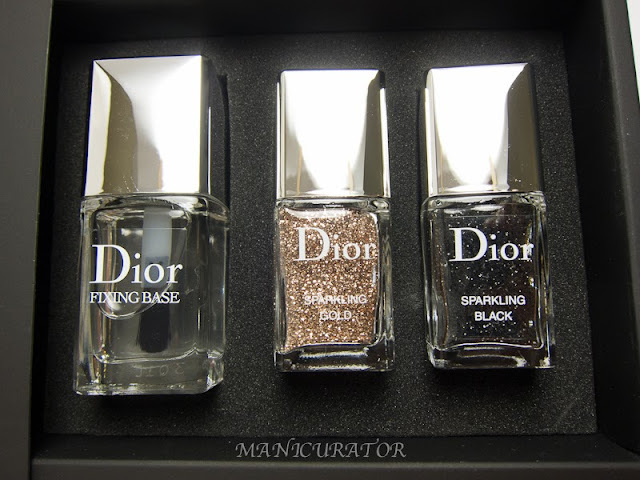 Dior describes these as "A couture manicure to be worn like jewelery for the most daring custom looks. Sparkling Gold and Sparkling Black powders are brushed over the base to create a feature nail or a total look. 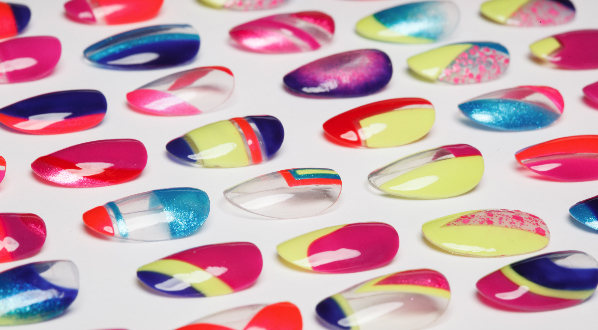 An all-over or gradation manicure that casts the shimmer effect into bold relief." These come packaged in a classy keepsake box, great for storage, I actually like to keep it visible on my shelf above my work space. You will note that the "powders" are a smaller size than the clear fixing base. You can see from the above photo that my glitters were a tad static-y and clung to the brush in an odd way. That didn't affect the application, in fact, it may have made it easier. These are literally, bottled glitters. 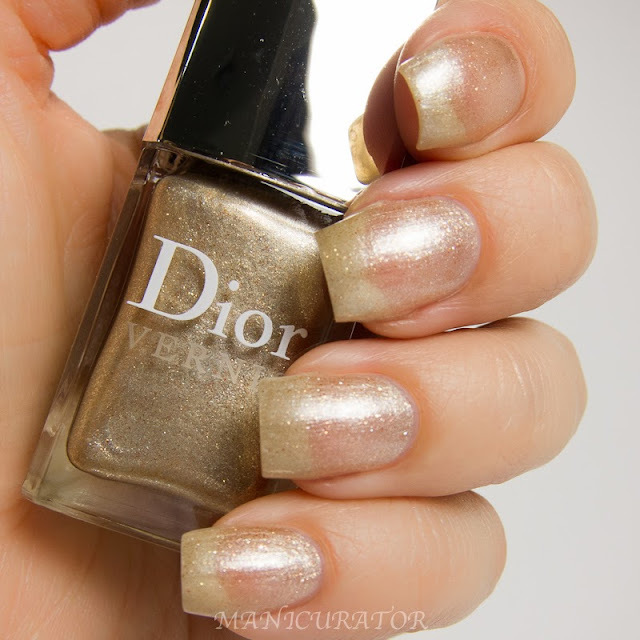 I started with two coats of Dior Golden Light (207). When that was fairly dry I applied one coat of the Fixing Base and then dabbed on the Gold Sparkling Powder. I worked one nail at a time. Be aware...this is on the messy side. I did this over a sheet of paper, so when I was done I could gather up and funnel back into the bottle any leftover gold glitter. The application phase of this manicure was surprisingly easy. The removal of all the extra glitters surrounding the nails and on the hands was more time consuming than doing the manicure! I used a dry angled makeup brush to brush them off. I probably should have just washed my hands..but I was afraid I'd wash some of the glitters off before I took pictures. 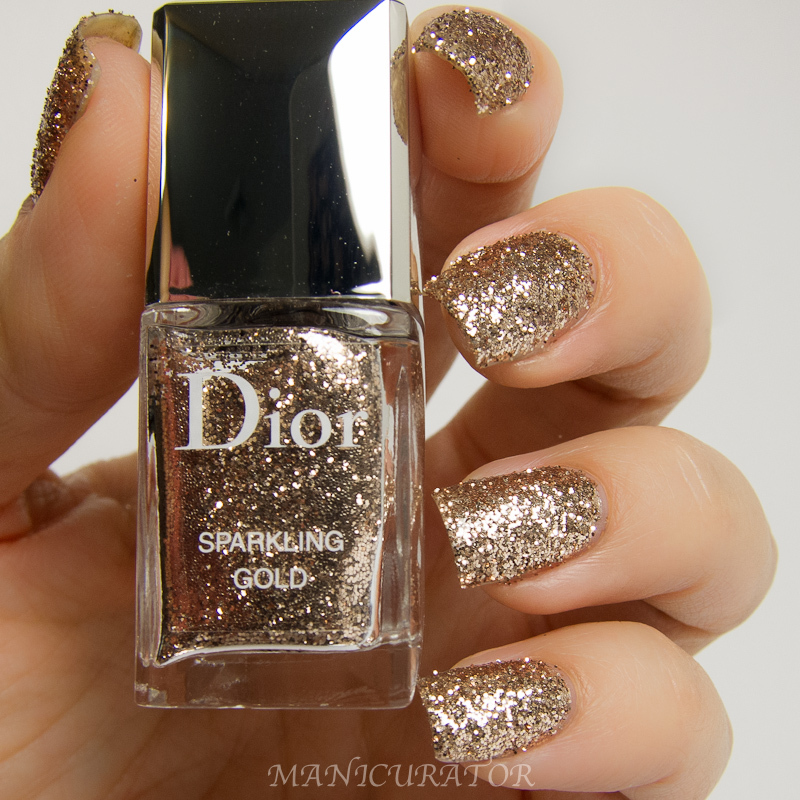 The camera only half captures the shine, sparkle and radiance this manicure has! It was literally stunning. I was a little nervous the glitters would fall off too much, plus I was curious, so the above and below photos are showing how it looked with Dior Gel Coat top coat on top. It went on easily and secured the glitters without taking away from the manicure at all. I wore this for 3 days, loving every minute. Next I tried Dior Sparkling Black. Sadly, I had a funeral to attend last week. I wanted something somber but something that was also classy with a spark of beauty. I knew I'd be wearing this. 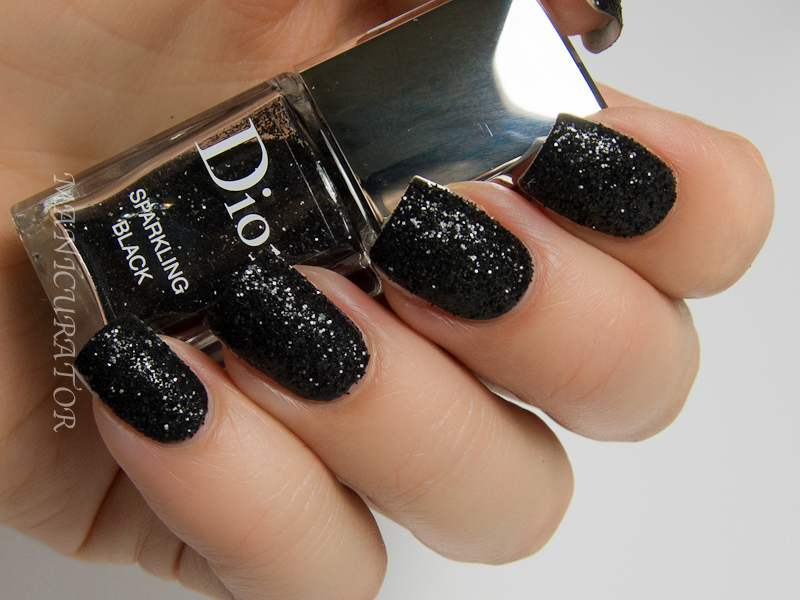 I began this manicure with 2 coats of Dior Untitled Black. Then I used the same procedure, applying the Fixing Base and black powder one nail at a time. I had less than an hour to do all ten fingers before I left for my overseas flight. Somehow I managed to get it done! I was surprised to discover that the black glitters in this set are smaller/finer than the gold. It creates a slightly different overall outcome. This one felt more refined. I also tried to top coat this one like I did with the gold, to seal in the glitters, but that backfired for me. The glitters just appeared to get swallowed up and disappear in the top coat, so I left them without top coat. That made me nervous as I had to travel a long way and needed this manicure to hold up. I absolutely loved how this turned out, so classy, subtle, elegant and chic. I wore these for 6 days straight, through 4 flights, and only minimal tip wear and the beginnings of chips when I removed it. What do you think? Would you go through the trouble of hand applying your glitter like this? Keep in mind, these are loose glitters. This set was sent to me for review, and I'm considering purchasing another set. That's how much I love them. They would be perfect for any Holiday party or celebration if you ask me! Oooh Sparkling Black is so pretty!!! They look very nice, but I think that 48 dollars for 2 bottles of glitter and basecoat is very steep. 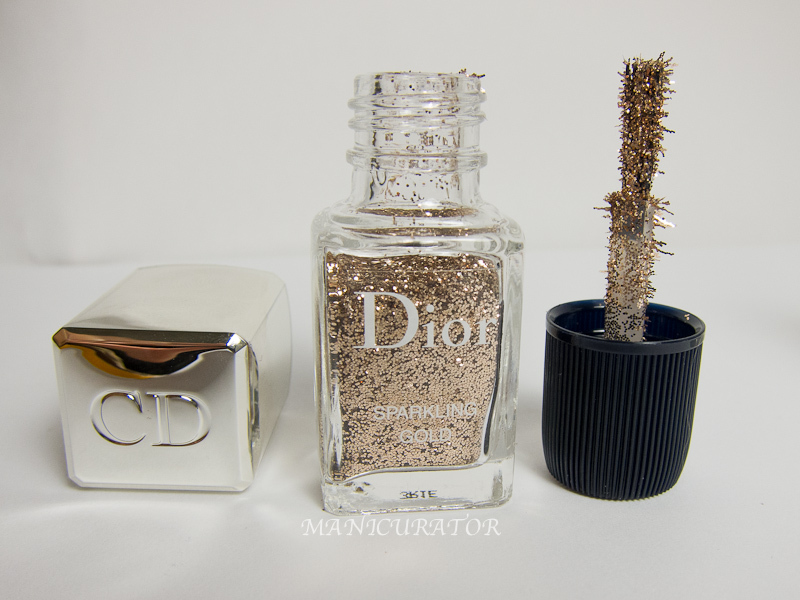 I certainly love Dior and have never regretted purchasing any of their polishes but $48 for what is basically just loose glitter....no, just no. Having said that, they do look great on you so I'm happy to admire. They are so beautiful and I'm a sucker for glitter. With that said, I can't justify the price tag. The gold glitter is my favorite! It looks great, but I feel like maybe it could be done with Seche Vite and regular glitter. I could be wrong. But now I want to try! I'm drooling over both of these. Especially that black!! In my opinion, Dior is always worth the price!! I've never been disappointed. These are beautiful! I bet applying the glitter with a brush was very convenient! And I'm really surprised to hear how well they wore! Gorgeous, Victoria! Oh my goodness! Absolutely gorgeous! My fingers would be covered in glitter! The black ZOMGGG I need it!! I'm with everyone else here. That black is AMAZING, but I can't justify $48 for loose glitter. I have this set, but haven't used it yet. Your swatches of Sparkling Black convinced me to try this ASAP! I'm sorry for your recent loss :( But omfg these are so gorgeous! Great review Victoria! I do love that black! I really like your review and how it looks on your nails. 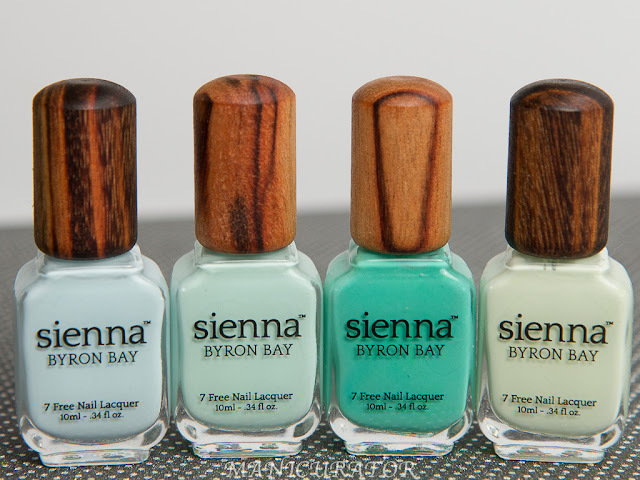 I have this set and I tried it on just one nail, it was very messy and I didn't find the time (and the courage) to try it on all fingers. I have read somewhere that instead of applying them with brush, you could just tap them from the brush into the nails. I tried that and it worked better, only as a top coat to another polish though, not on its own. They look fabulous. What's the fixing base like in comparison to using clear polish/topcoat? I am sorry that it was f uneral that made your the black glitter, but it is stunning! They both look gorgeous, but the gold one is just ah-ma-zing! They certainly interest me. Such pretty goodness! I love so much your blog ! It is so beautiful, bravo ! So gorgeous. I'd never stop staring at my nails if they looked like this haha. I'd love to see a black glitter polish that's as sparkly as that, too. I'm quite curious about what the fixing base actually is - I wonder whether you could achieve the same effect using normal polish/top coat/something and a wee pot of glitter. Love the gold very sparkly!